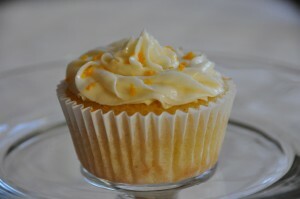 Since Clementines are in season and oh so good I decided clementine cupcakes seemed a perfect treat for early January. All the Clementine cakes I found online seemed to have 6 eggs and tons of almonds or almond flour so I had to change a few things to make this work. I used applesauce instead of 3 eggs and all-purpose flour instead of almond flour. To make this gluten free simply use “Better Batter” gluten free flour instead of the all-purpose flour. Enjoy! Preheat oven to 325 degrees. In a blender or food processor drop in your peeled, quartered Clementines and sugar. Turn on Low or pulse for 2 minutes. Add in butter substitute and turn on again for 2 minutes. Add in applesauce and turn on again for 1 minute. In a separate large bowl add the flour and baking powder and whisk for 1 minute. Then add in the ingredients from the blender plus the vanilla and mix well. Place paper cupcake liners in your cupcake pans and using your cupcake scooper fill each cupcake liner. Should be 3/4 full if you don’t have the pampered chef cupcake/muffin scooper. Place the cupcakes in the oven in the center on two racks nearest the bottom. Bake at 325 degrees for about 18 minutes. Do not open the oven door to check. Pull them out near 18 minutes and using a toothpick test the center by inserting it quickly but gently , if it comes out clean then they are done. Gently set them on top of the stove to begin cooling then after 10 minutes set them on your cooling rack or another cooler spot. Since these cupcakes do not have eggs to hold them together you do need to be a little more gentle with them. While they are cooling you can make the frosting. DO not frost until COMPLETELY cooled. Peel then squeeze the juice from three Clementines into a little measuring cup…should be about 60 ml. Pour your powdered sugar and butter substitute into a large bowl and mix on low using a hand mixer. After it has all been mixed add in your Clementine juice and mix again on low for about 1-2 minutes or until it is well mixed. Then add in the Vanilla and the pinch of salt and mix again on low for an additional two minutes. Finally add the well mixed frosting into an icing bag with a Wilton cupcake decorator tip. I prefer 2C for my cupcakes. Note: if this is your first time.. put the tip in the bottom of the bag first then scoop the icing into the bag. Twist the top of the bag, then you are ready to ice. In a circular motion squeeze out the icing onto the top of the cupcake, working from the outside edge in to the center, finishing by pushing down and back up in the center for the tip. Once they are all iced. Take your zester and another Clementine and zest some right along the top of the cupcakes for a finished touch. Enjoy! !